Welcome to out newest segment here at Merc With A Movie Blog, COMEDY CORNER, where we review the movies that make the world laugh, or those that just try to. This week's pick is a caper comedy from 1974 starring Bill Cosby and Sidney Poitier, UPTOWN SATURDAY NIGHT. Howdy fellow film freaks, Robert here. Pop quiz, hot shot: you've just learned you won the lottery. But this announcement comes to you only just after you've lost your lottery ticket. What do you do? The answer is obvious: you do whatever it takes to get that ticket back. And that's the story of Uptown Saturday Night, the first of three projects that teamed legendary comedian Bill Cosby with Academy Award-winner Sidney Poitier, here trying his hand at comedy for the first time. Poitier plays Steve Jackson, a blue-collar metalworker who learns that he has won $50,000 in the lottery. In case you're wondering, that's just shy of a quarter million in today's dough. Unfortunately, Jackson lost the ticket when he and his friend Wardell Franklin (a shaggily-bearded Cosby) were robbed while visiting an after-hours club. Jackson determines to get the ticket back, and Franklin offers to help. Their search for the ticket will take them all over the city on a hilarious series of misadventures, and finally land them in the middle of a power struggle between two rival gang bosses. Along the way, the film is packed with cameos and brief appearances by the names of the day, each of whom looks like they're having a ball with their roles. These include Rosalind Cash, for whom Uptown Saturday Night was just one of 55 separate projects she would turn in over the 1970s and 80s, according to IMDB. 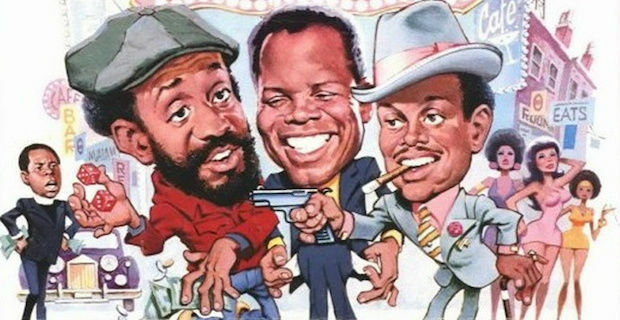 Comedian Flip Wilson appears as The Reverend, the preacher at the church Franklin and Jackson attend; Richard Pryor plays a con-man posing as a private detective, and Harry Belafonte (aka "That Guy who did that Song about the Bananas") plays Geechie Dan Buford, one of the two crime bosses mentioned earlier. The other gang boss, Silky Slim, is played by Calvin Lockhart, who would later appear as the voodoo priest King Willie in Predator II. Cosby gives a great performance in this movie; he and Sidney Poitier have excellent chemistry and balance each other well. Poitier seems to me to be relieved to get a break from dramatic roles. He still turns in a performance that's worthy of him, but he obviously finds comedy to his liking, and the role of the straight man suits him well. The movie itself is another take on the comedy trope where a simple accident that could happen to anybody sets in motion a chain of events that grow increasingly ridiculous until the end. Unfortunately, this movie is no longer in print, though you can find it on Youtube. It's worth a watch if you've never seen it, evevn if you need to put aside your feelings about Bill Cosby to fully enjoy it. I consider Uptown Saturday Night to be the funniest movie Cosby was involved in, and for me, the controversy around the man himself doesn't change that. Uptown Saturday Night is rated PG.